In this series, I highlight some of the interesting choices current Kickstarter creators have made regarding their project’s reward levels, stretch goals, and overall campaign design (the projects themselves, not the content or product). This isn’t meant as an endorsement of these projects (these creators did not ask for me to promote their work–I disregard all such requests); rather, I’m looking for unique elements of projects that might inspire other creators to do the same (or do the opposite, in some cases). Long Video: The video for the Beer Hammer clocks in at 4:30, which is well over the 2-minute threshold I recommend. However, there’s an exception to every rule. 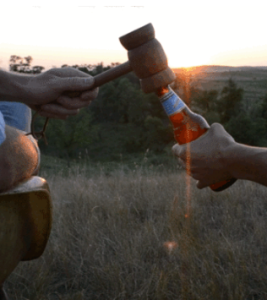 This video tells the story of the Beer Hammer in a way that compels you to back it. An Effective Gif: I very rarely like the use of gifs of Kickstarter pages because they make the text around them really hard to focus on, but in this case, the gift shows the simplicity and cool-factor of the Beer Hammer in use better than a static image could. Christmas Delivery Early Bird Reward: Instead of using price as an early bird reward (which I con’t recommend), the Beer Hammer used Christmas delivery as an incentive for backers to act now. The price is exactly the same either way. In the context of a product like this that is made one at a time, it makes perfect sense for some backers to get theirs before others. Free Customization: This is one area where I’m not sure that Luke made the best strategic choice, but it fits well with his brand and makes me root for him. Every single beer hammer comes with a name of your choice burnt into the side, free of charge. Normally this would be a premium option, but Luke is giving it away! Very cool. The information is kind of hidden in the video, so I think Luke would have benefited from mentioning it in the reward text, but the project is doing well despite that. John Coveyou (who recently posted a very interesting statistical analysis on $1 reward levels) returns to Kickstarter with a beautifully illustrated open-drafting card game about genetics. The unique element that stands out to me here is something I previously saw on Privateer: for every 300-500 Facebook shares, the stretch goals are reduced by $250-$1000 (it escalates). Also, right below the Facebook stretch goals (it’s worth taking a look at the chart, which is really well done), there’s another chart for backer micro goals that’s based on the overall number of backers and a limited timeframe that actually expires tonight (I didn’t realize that as I was putting together this post). I like little goals that aren’t funding based, and the deadline gives backers another reason to join the project now instead of later. Some products need a demonstration, even if it takes extra time in the project video. This is one of them, and the project video does a fantastic job at showing how the Undress works. 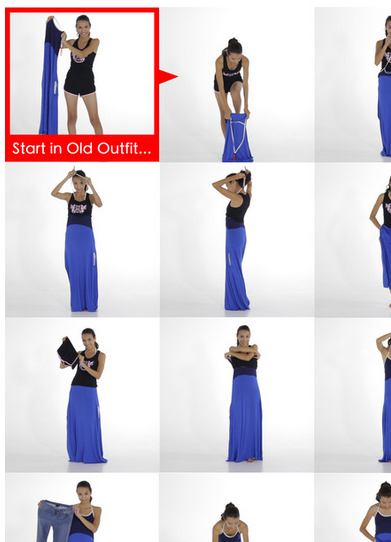 There’s also an image lower down on the page that shows the step-by-step process, but I think the video shows it best. For all of its success, the Undress makes one key mistake that I’ve talked about in my entry about focus: Potential backers who are looking at this project are looking for the Undress itself, not a t-shirt or shawl that have nothing to do with the innovative functionality of the Undress. Those ancillary products could be mentioned as add ons or as higher combo levels, but to have them priced below the most important reward–the Undress itself–is a mistake that I’d recommend all creators avoid. Demonstrating my point are the sheer lack of backers at those reward levels. Lanterns is a very well constructed project, and one of my favorite elements is the thematic $1 reward level. If you back at that level, they’ll place a floating lantern in water for you and dedicate it to your honor. Aside from the many benefits of the $1 reward, this shows that these creators are completely focused on the overall experience they’re trying to create for backers. Also, Lanterns has one of the best shipping charts I’ve ever seen on a project. It takes all the calculation out of the process, as backers who want one copy can see the shipping amount subsidized and the price they pay, and backers can also easily see the amount they should pledge for 2, 3, 4, or 5 copies. It’s so clear and easy to use–absolutely brilliant. I can’t get over how clever this idea is. I’m not sure if it’s actually working, because Dead Drop is struggling to fund, but you have to admire Patrick’s innovation: Dead Drop is a 13-card game with a few other components. The stretch goals for the game include full decks of those 13 cards by 7 different artists, each with completely different styles. These aren’t cards you add to the game–they are completely separate cards you can use to play. 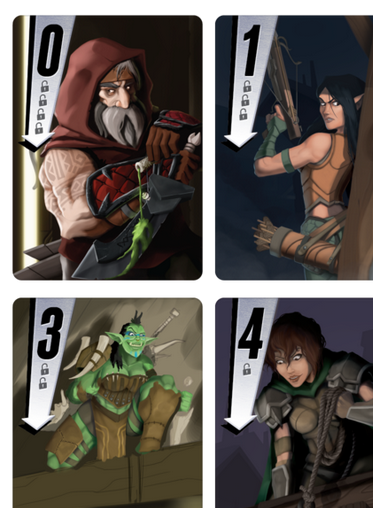 Just looking at these cards on the project page, I can’t help but be excited about them as stretch goals. I think I saw some grumblings online about people wanting more content for the original game, but if the game is perfect with 13 cards, there’s no need to add more stuff. This is the Love Letter model–AEG keeps coming out with new editions of Love Letter that are functionally the same, and because of the price point of the game, people keep buying them. One element to keep an eye on here is that all but one of these alternate-art stretch goals are included in the $22 reward level, not the $12 reward. I rarely advocate delineating stretch goals like this (remember the mess this caused on the Tokaido Collector’s Edition? ), but I actually think it works here because of the precise type of stretch goals Patrick is offering. Obviously there’s a lot of subjectivity to these blog posts, so I’m very curious to hear what you think (in a constructive way–these comments aren’t a place to complain about other projects). Which of these innovations is your favorite? I received a prototype copy of Dead Drop to review so I’ve been following the Kickstarter to see how it’ll do and, while the alternate art decks are interesting, I think they have created big problems with the campaign (among other issues as well). In the Dead Drop Kickstarter you can get the base game plus one additional deck for $12. For $22 you also get the deluxe package, which includes the base game and the same additional deck, plus a nicer box, carrying bag and slightly nicer tokens. $10 seems like a pretty big bump up for no a whole lot of benefit (honestly my promo copy of the game works fine and its just in a ziploc baggie with no tokens). And as the campaign hits more stretch goals the only thing added to the deluxe version is more decks with more artwork (and nothing is added to the standard backer level). There is no improvement in components, no extras to enhance the game, nothing. So basically if the game hits every stretch goal all a deluxe backer has is 8 copies of the same game. And if the deck a backer was really hoping for is one of the higher stretch goals this will actually encourage people to down grade their pledges if it looks like the stretch goal for their favorite deck isn’t going to be reached. I wouldn’t be surprised if we see a lot of backward funding on this project towards the end. Another problem with having only so many different artwork decks as the stretch goals is that it really detracts from the theme of the game (the little bit of theme that is has anyway). At its core the game is a deduction game, so the spy theme for the base deck fits, but it’s not critical to the gameplay. So while the base theme fits the game it does feel a little pasted on, but that’s OK. However including 7 other decks of artwork really enforces the idea that the theme is just pasted on. Especially since the new artwork doesn’t really have anything to do with the original theme in most cases. With Love Letter at least the different variants all still follow the same theme of trying to deliver a letter of courtship. Yes, the game could work with other, unrelated artwork, but the basic story would need to be the same. Dead Drop would have benefited from having a more cohesive theme throughout the decks, however I think they would have benefited even more by only having one or two alternate art decks instead of 7. They should also have either let the backers choose which additional art deck they’d like at the Deluxe level or have the backers vote on the order that the decks should be released. Or maybe have each deck have a different distribution of cards so that each deck would play a little differently. So aside from the merits of the game itself (I do have issues with how the game plays with 2 and 4 players, it’s best with 3 by a long shot), this Kickstarter campaign is a hugely flawed campaign. Which is a shame since Crash Games has had so many other successful campaigns in the past. I will be very surprised if this campaign for Dead Drop funds, however I hope Patrick takes all the comments to heart and restructures this for a relaunch (and also adds in some adjusted rules to make a 2 player game more interesting). The game is good, but the alternate art decks are actually hurting the campaign right now. George: Thanks for sharing your thoughts on the unique Dead Drop project. This line is interesting to me: “There is no improvement in components, no extras to enhance the game, nothing.” While it doesn’t work for every game, I think it’s neat that Patrick has presented a complete game with nice components from day 1. He could have stretched out card quality and things like that in the stretch goals or added a bunch of stuff that makes the game unnecessarily complex, but instead he found another way to present it on Kickstarter through the alternate art card decks. I see your point about theme, but it also looks like the artists had a lot of fun creating a story through their 6 card illustrations. That said, despite my admiration for Patrick’s creativity, the proof is in the pudding: The project is struggling to fund. We’ll see how it turns out–perhaps Patrick’s strategy will result in a very strong final 48 hours. Agreed that the base game is complete as is and high quality components (my promo copy is great), which makes the stretch goals even less compelling to shoot for. Unless you want 8 copies of the game or really want that last deck of artwork for some reason there’s no big reason to back at a higher level. And if you do back at a higher level each stretch goal reached means you get another copy of the game that you can give to a friend, meaning the friend doesn’t need to back the project at all. The whole concept behind the additional artwork as stretch goals instead of addons or just included with different pledge levels seems self defeating on so many levels. I love the artwork in the additional decks (the gunslingers deck is awesome), but the structure of this campaign just doesn’t work. Check out the campaign for Monster Mansion: https://www.kickstarter.com/projects/chancegamer/monster-mansion That’s a project that shares a few similar ideas as Dead Drop, but instead of making the Zombie Collector, Vampire Collector, etc. extras stretch goals they are included at different backing levels. Then the stretch goals are actual game enhancements. And the stretch goals offered (additional monsters, characters, etc.) are chosen by community input. I think those are much more effective methods of handling this, and like you said, the proof is in the pudding. Monster Mansion is 183% funded with 19 days to go (even if it is his third shot at a campaign). I think Dead Drop would probably have had a lot more success without the deluxe tier. They should have just offered the base tier with only the spy deck and basic tokens for $12. Then have additional tiers for the additional decks. Maybe an $18 tier for one additional deck (and then 3 pledge categories at that level for three of the available decks), then a $24 tier for two additional decks (with a few different preselected combinations), and a $30 tier for three additional decks, and $50 for all eight decks. Then make things like the drawstring bag, nicer tokens, special box, etc. stretch goals that would go toward all backer levels (or maybe have a $10 tier that would only be the basic game with no stretch goals included and the $12 level would include the stretch goals as they are reached). George: That’s an interesting point about the stretch goals meaning that your friends don’t have to buy copies of the game. I thought at first there were other components required, but it looks like there’s just a few tokens–you could use any types of token for that. Those are some intriguing ideas for reward levels. I’m not sure I agree with those prices, but perhaps Patrick would have been better off simply including a few of those alternate art decks in a slightly more expensive deluxe version from day 1 instead of making them stretch goals included for free. Thank you for mentioning Lanterns in this post! I left some comments on a previous post here about working hard to get rid of the shipping chart completely, but I ended up coming back to it: I just could not fit all the information I wanted in the reward text. If I had to have a shipping chart, I wanted to be incredibly easy to use. As you noted, the chart lists the prices for 1-5 copies. I have had people back at all five of those quantities, and none of them have emailed me to ask any questions: they have just pledged the appropriate amount without any trouble. But then someone organized a group buy for 9 copies (! ), and they weren’t sure how much to pledge; it took a few emails back and forth to get it all calculated. I think that speaks to the importance of the chart the way it is: if the exact pledge amount was listed, backers felt confident pledging it. Randy: Thanks for chiming in! I’m glad you found a way to add the shipping chart in a way that adds a lot of value to backers. Saving backers time (that they would have spent messaging you for the exact information) is great, and it probably helps you too since there’s less of a knowledge barrier to entry. Clarity is king! I like what peptide is doing but don’t think that FB shares can really be tracked. According to KS, my game had 250 shares (and 173 backers). I don’t really trust that stat. I think that the only way to do it is currently to write a FB post or make a tweet yourself and check how many folk share it, since it’ll tell you right there on FB/twitter. behrooz: I think that actually touches upon the cool aspect of Facebook Share stretch goals–it’s something non-backers can do to support a project even if they don’t want to pledge to it. So those numbers are most likely accurate, meaning that a number of non-backers shared your project. The video, gif, early bird and free customization work very well together. They all support the project’s goal. I didn’t even notice the video was so long because everything in there had a good reason to be there. Decreasing the amount needed for stretch goals is something backers always want. To give them a way to reach it by project shares is very smart. I didn’t like the “number of backers”-goals since the later ones actually give me something I already have from the previous project. Good video demo. Backers will know how to use it without any complicated instructions. Limited reward tiers give the project a sense of urgency. Great $1 reward and chart. This creator clearly learned from you, Jamey. The idea of having alternate art as a stretch goal isn’t bad, but they shot themselves in the foot by revealing all art from the start. That way you’re bound to disappoint people about the decks for which the goal has not been reached. I think this would’ve gone differently if they revealed one deck at a time. Stijn: Thanks for your comment. I think that’s a really good point about revealing the art slowly instead of all at once at the beginning on the Dead Drop project! If we were to do it all over again, we would remove those reward levels and focus on The Undress alone, and have add-ons in a different way as you mentioned. Our backers want The Undress- everything else is “extra”. Good lesson. We limited our rewards to keep things manageable and keep tabs on all of it- we add qtys as needed as long as we feel confident we can fulfill the orders in a timely manner as promised to our backers. Luckily our backers have been very enthusiastic about the products (beyond our expectation as you can see with over 4x our goal achieved)! We have truly enjoyed this Kickstarter journey. It has been a wild roller coaster ride, and with a few days left to go, we’re working day and night to maximize our learning before we transition into the “real world” of delivering the promise, and building a real, sustainable enterprise. We feel very blessed! Thank you for looking! Dennis: Thanks so much for your comment! I always appreciate when creators chime in to share their insights. That’s an excellent point about limiting rewards to keep the project manageable–I’m going to add a note about that to the post, because it’s something that many other creators should keep in mind. If it’s okay with you, I’m going to mention that specific point in my Kickstarter book in reference to the Undress. It fits perfectly into the chapter I’m currently writing. Congrats on your success, and all the best as you take the next step towards bringing this innovative product to market. Those photos are beautiful, Randy! Thank you for sharing. By the way, from what I saw and heard, Lanterns was one of the most-played games at Geekway this past weekend. That’s great to hear! I’ve heard nothing but good things about the convention, and I hope to make it to it one of these years.